Double treat: The restaurant (above) and the bar are designed by Singapore’s Poole Associates. A new restaurant at a Taj hotel is always something to look forward to—more so when it comes with an attached trendy bar. Looking back at some recent launches, I can’t say I was excited by the idea of Varq though you can buy me a vegetarian meal at the reinvented Thai Pavilion in Mumbai or Wasabi (in Delhi and Mumbai) any time. Yes, nearly half the latter’s clients are vegetarian thanks to the restaurant’s exciting selection of modern Japanese vegetarian food. 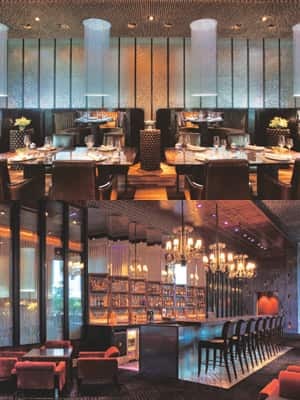 Last Saturday, I dragged the home-loving husband along for a preview of the new Blue Ginger restaurant and the Blue Bar at the Taj Palace Hotel in Delhi. It replaces the Tea House of the August Moon—I know you loved it, but when did you last visit? When the sensory overload was over and we had crawled back home, it was clear that it’s not easy to do justice to the bar and the restaurant. So pick depending on your mood. We began the evening at the Blue Bar where innumerable heavenly liquid treats await. The dishy bartender Nick (he’s got a wife in Pune) is passionate about infusions and his eyes get a mad chemist’s gleam when he explains how he creates his wild concoctions. My favourite was The Godfrey—Cognac, Grand Marnier, blackberries, crème de cassis and lime juice. I think Nick likes the way we listen wide-eyed as he decodes his formulae because he even brings us a shot of Woodford Reserve bourbon infused with a Montecristo No. 2. “It’s not yet fully ready," he warns. “Go slow." Both the husband and I are used to the strong stuff and this potion is actually quite smooth compared to some of the drinks we’ve sampled in the Indian and South American countryside. Of course, Nick won’t serve it to you sophisticated folk straight up, he’ll use it to make what is bound to be Delhi’s best Manhattan. More outrageous infusions on the menu include the Tequila Infused Marshmallows and (my favourite, even though they weren’t available that day) the Absinthe Gummy Bears! If you can tear yourself away from Nick and the chandeliers above the bar, there’s lovely sink-in outdoor seating that overlooks an expanse of green and the pool beyond. In addition to lots of Asian-inspired signature cocktails (the Asian Whiskey Sour uses a Japanese whisky infused with lemon grass) and crazy infusions, the bar also offers all the classics—the Bloody Mary is crafted from 42 Below Vodka, a dash of Tio Pepe dry sherry with their own secret BM mix. And if you decide to stay put at the bar, there’s enough on offer here to line your stomach—oysters, mussels, bratwurst, sole, cheeses and err, even paneer. This is Delhi after all. Drinks done, we staggered to the exquisitely designed Blue Ginger where we opted for a raised semicircular booth, accessorized with silver pillows and lit by a dramatic waterfall of light from the fibre-optic chandelier. We ate on a mother-of-pearl table with bronze legs. Even if you’re a regular at the Blue Ginger in Taj West End, Bangalore, the revamped menu holds enough surprises with its Chinese, Indian, Thai and French influences. I resisted the urge to order my Asian restaurant staple, curry and rice, and instead scanned the list of hot and cold appetizers. Van Nguyen, the turbo-charged Vietnamese hostess who has lived in India since 2004 and who’s currently teaching the staff how to pronounce all the Vietnamese names on the menu, persuaded me to be adventurous. I picked baby lotus stem and carambola (star fruit) salad and tofu rock salt. The husband, who needed no encouragement, chose grilled tenderloin picatta on lemon grass stick and crispy fried soft shell crab with chilli plum sauce. The salad, with slivers of lotus stem, oversized stars, carrots and lots of flavourful basil, was brilliant; the tofu rock salt is a much healthier version of the corn curd you usually eat at Chinese restaurants. The tenderloin, which was served like a kebab on a stick of lemon grass, got the husband’s stamp of approval. For the main course he picked grilled Basa (a Vietnamese fish) Hanoi style and I yielded to our server Rajesh’s suggestion and ordered the crispy lotus root stuffed with vegetables and topped with tamarind sauce. Van kept popping by with wisdom on Vietnam and the husband told her about the time he ate a nine-course snake meal in a village outside Hanoi. “You want some cat? Some rat? We can catch some and cook it," she said. By the time we were done, there was certainly no space for dessert, not even for the lemon grass tiramisu. I know we’re going back after the place opens on 4 October, me to the bar and the husband, the restaurant. Lounge usually pays for the restaurants we review except when, as in this case, the restaurant hasn’t yet opened and the prices haven’t been finalized. When I received the prices later in the week, I noted that the Tequila Infused Marshmallows and the Absinthe Gummy Bears were priced at Rs950 plus taxes. Hmm. The husband said his crab and fish were extra salty and me, I got the fright of my life when my lotus root appeared. There they were, four giant standing-up wheels stuffed with minced-to-a-paste veggies. The things I try for you, dear reader. Eats at the Blue Bar are priced between Rs650 and Rs1,250 and cocktails from Rs550 to Rs950. At Blue Ginger, appetizers range from Rs400 to Rs1,200 and mains from Rs550 to Rs4,500 (for the full Vietnamese roast duck with accompaniments). Add 12.5% tax to all the prices.